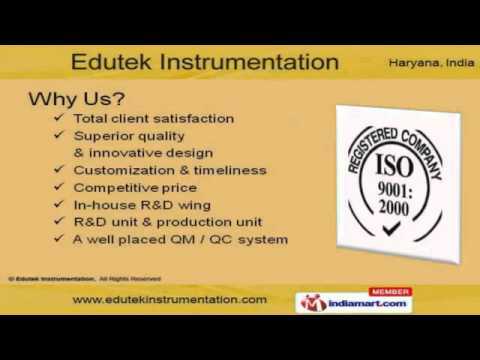 Welcome to Edutek InstrumentationManufacturer & Exporter of Lab Glassware & Scientific InstrumentsWe are an ISO 9001:2000 certified company, established in 2009 at Ambala. Our products findapplication in Chemical, Pharma, F& B sectors across the country. Innovative design, QM / QC system & Competitive price help us to achieve an unrivalled position in theindustry. We offer a vast range of Glassware, Furniture, Chemicals & Laboratory Instruments. Glassware & Balances offered by us are available at industry leading prices. We offer Chemicals & Equipments that are extremely reliable. Our Scientific Microscopes are a class apart. Along with that we offer Furniture & Screens that are nothing but the best solution for all your needs. We also provide Laboratory Instruments that are well known for their outstanding performance.